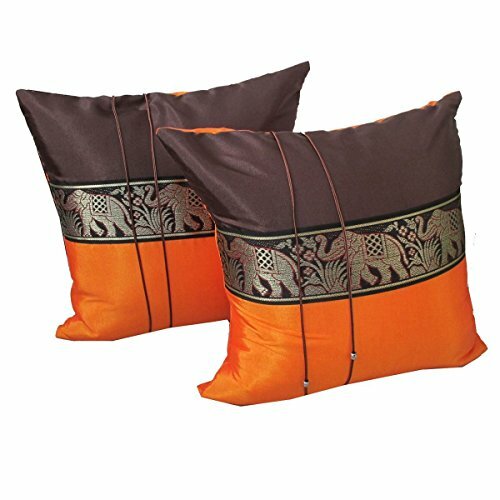 Set of Two Lupadu Dark Brown Orange Thai Silk Throw Cushion Pillow Cover Case With Elephant Middle Stripe for Decorative Living Room Sofa Car Size 16'' x 16'' by Lupadu at Thai City Deals. Hurry! Limited time offer. Offer valid only while supplies last. These beautiful pillow covers made of Thai silk blend with Polyester with cute elephant design middle stripe and printed polyester fabric accent. These beautiful pillow covers made of Thai silk blend with Polyester with cute elephant design middle stripe and printed polyester fabric accent. Selling price for one pair. These covers are fitted with standard 16"x16" pillows. Its beautiful and unique designs are suitable to any room Decoration and great gift for all occasions. Note : Hidden zipper closure at edge seam. For Bedding, Sofa, Car and Living Room Decoration. INSERTS ARE NOT INCLUDED. Care Instruction : Hand wash only, Cold water (max temperature 40 celcius) with Mild detergent, Hang dry under shade. If you have any questions about this product by Lupadu, contact us by completing and submitting the form below. If you are looking for a specif part number, please include it with your message.